On this page you'll find word wall words, and word wall headers for your classroom. We have Dolch word cards, Fry Instant Sight Word cards, colors, numbers, and many other sets! This list has all of the pre-primer Dolch sight words. This file has all of the primer-level Dolch sight words for your word wall. These word wall cards have level-1 Dolch sight words. Sight words for level-2 Dolch are all included on this PDF. These word wall cards have level 3 sight words. Complete your word wall with these noun sight word cards. This file has the first 100 sight words in the Fry list. 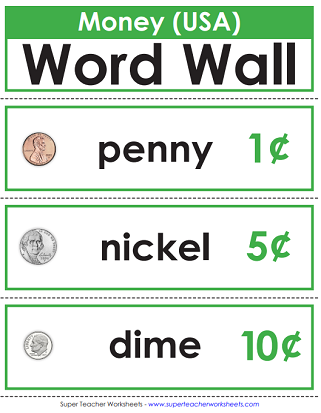 Here's you will find word wall cards for the second hundred Fry words. From this file, you can print out the third hundred Fry sight words. The fourth hundred Fry word cards can be found here. Here's the PDF file with the next hundred Fry sight words. 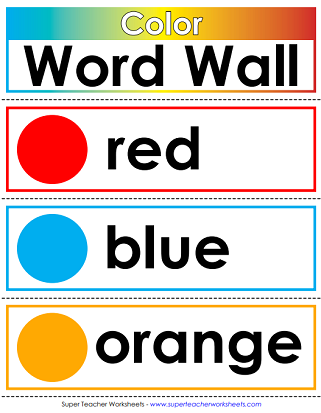 This word wall file has color words: red, blue, green, orange, purple, brown, gray, white, and black. 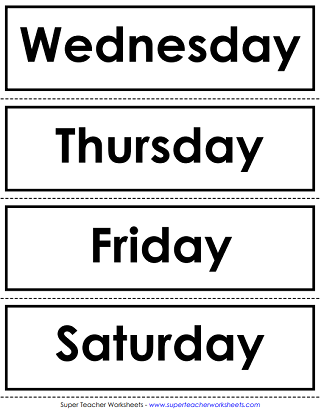 This word wall card set has Sunday, Monday, Tuesday, Wednesday, Thursday, and Friday. These cards have months of the year (January through December) on them. Use them in a pocket chart or above your classroom calendar. Each card has a coin or a dollar bill, with the amount, and the written words. This word wall has number words for zero through twenty-five, as well as thirty, forty, fifty, sixty, seventy, eighty, ninety, and one hundred. This template has blank, rectangular cards for word walls or pocket charts in seven different colors. These pages have games and worksheets for teaching phonics. Here you'll find lesson planners, attendance sheets, weather charts, and more.